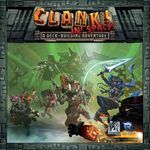 Sweetners: Clank! In! Space! : Code Red.